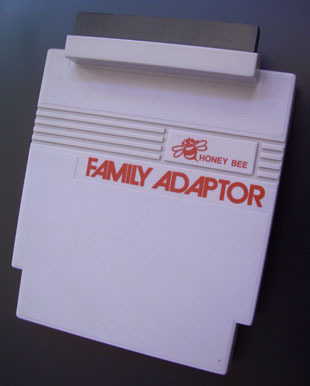 The HoneyBee Family Adaptor converts your Famicom games for play on your NES. It’s one of the more interesting of the pins converters, because it is as large as the NES cartridge, which means no ribbon is needed to pull this adaptor out of your NES. The Family Adaptor has the same features as an NES cartridge, except for the top, where the Famicom game would be inserted. As you can see from the image, the top pins connector comes out of the front-top. This allows for the cartridge to be locked down into a front-loading NES. This HoneyBee is very hard to come by and likely will cost you should you find one for sale. It could bring between $20 and $60 at auction because it’s so unique. This HoneyBee is as large as an NES cartridge.